I was quite excited about our next method of transport as we were heading over the Hai Van Pass on the back of motorbikes. Our guides Phu & Rin arrived just after 8am, strapped our bags on the back and then we were off. Phu took us through the vegetable village in town which is where all the veg is grown for market. It looks like a neat, tidy and huge allotment…. very impressive. 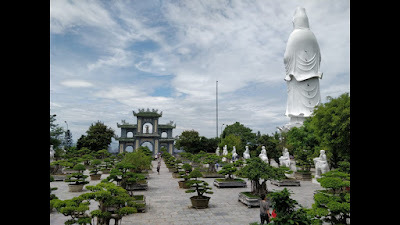 We’d asked for our first stop to be at the Linh Ung Pagoda on the Da Nang peninsula, as this is where the large statue of Lady Buddha is located. This is the largest statue of lady buddha in Vietnam, at 67m and bright white she can be seen from anywhere in Da Nang, gazing over the bay. Although early in the morning there was still a lot of tourists and worshipers but as it’s well away from the town and the traffic it was still quite peaceful. They also have the most amazing display of huge bonsai trees in front of the pagoda, which used to be a very time-consuming hobby of my own and it was lovely to see such big examples. Back on the bikes we headed for the Hai van pass and were soon off the motorway and heading uphill through smaller towns. I was loving being on the back of a bike but obviously hadn’t been paying much attention to my belongings as after a short burst of speed I felt something drop out of my pocket! It took me a few seconds to realise it was my wallet and although I didn’t have any cash in there, my ID and banks cards were. I frantically tried to explain this to Rin who bless him didn’t speak a word of English, but he understood that something was seriously wrong and we turned back. We did a couple of passes but as Paul and Phu had gone on ahead we needed to find them and explain. I’m seriously panicking by now but after explaining everything to Phu, who then translated what this mad hysterical woman was saying to Rin, we all went back for another look. We couldn’t see it anywhere and were discussing next moves when two local ladies came up. They had been handed my wallet by anther lady that had passed by and we were able to ring her and thank her for her honesty and quick thinking to hand it in near where it was found. Feeling slightly foolish but very grateful we carried on to the viewpoint at the top of the hill. 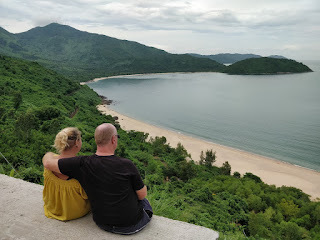 It was a lovely view with a slight concrete overhang with the hill and beach below and Phu suggested that Paul and myself perch on the edge for a romantic picture. This was spoilt somewhat as my sunglasses toppled off my head and slid down the concrete slope and off the edge! I was upset and Paul was pretty cross but I don’t think the picture gives it away. Fortunately, I was again saved by a local as the owner of the drinks stall went down the slope and managed to grab my glasses returning them to me with a grin. So, feeling doubly stupid and now a little anxious of what the 3rd disaster might be we continued on. We didn’t suffer anymore incidents and after a few more photo stops on the way over the mountain we headed down to Lang Co beach for some lunch. Here you could swim if you wanted but it wasn’t the nicest beach, or the cleanest so we settled with a lunch of BBQ giant Clam, French fries and a Papaya salad, all of which was gorgeous. Back on the bikes we headed to a place called Elephant Springs. This is natural spring fed river that is formed into man-made pools and temporary cafes for tourists and the like to cool off in. It is only here in the drier seasons as come rainy season the river runs high and washes all the temporary structures away and although it’s highly tourist driven with the expected bit of rubbish, which is mainly beer cans and the foam matting they use as slides, it’s quite nice. I have no idea how much it was to enter as this was included in our easy rider package, but I overheard that you do have to pay extra to sit on the shaded wooden matted areas and use the changing rooms (which are basically just urinals/ toilets but at least there is a door). We spent an hour or so here swimming in the clear cool water before heading back on the bikes for the last leg of the journey. 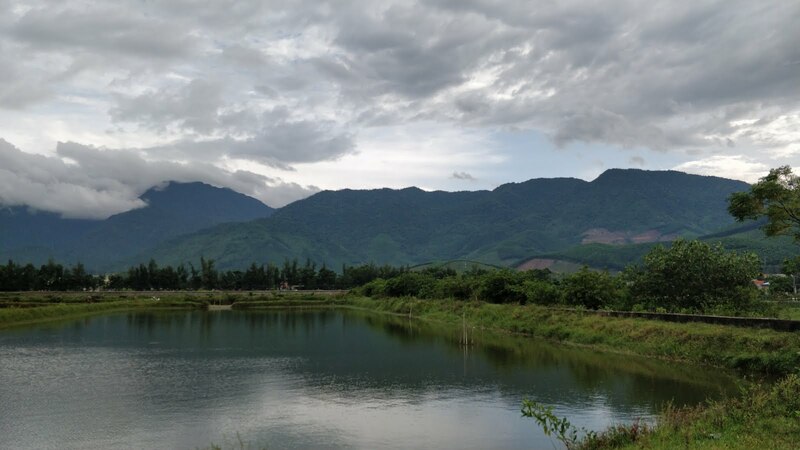 By this time we, as non-bike riders, we were getting very numb and painful bums and we still had a couple of hours to go before hitting Hue. 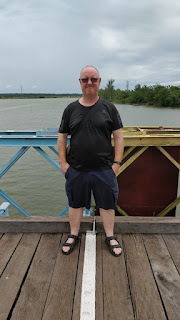 We had a brief welcome stop at a Lagoon, which whilst not the prettiest place enabled us to stretch our legs and see the fishing boats and then we hurtled on towards our destination. Our digs in Hue was the Cherish hotel very close to the main hub of restaurants and bars but within walking distance of the old Citadel as well. It was upper budget but had a large double room, en-suite, A/C, TV and much to Pauls joy a big buffet breakfast. With only 3 days here we quickly set off to find our prices for tours and sample some of the local beer and food. Sadly, Bir Hoi wasn’t a thing here but they did their own local beer called Huda, which was bottled and still only 10 – 25k dong, basically under £1. They also close the main restaurant streets to traffic at the weekend and fairground type games stalls and live bands pop up to entertain the crowds giving it a holiday, festival type feeling. We stopped at a placed called Lam Travel on our rounds and here the very talkative owner told us about the different DMZ zones and reprimanded us if we didn’t look at him or listen to him when he spoke! He was quite funny though, so I give him my WhatsApp details, which meant I then got goodnight and good mornings messages from him until we relented and booked a tour with him. We spent the following day walking around the old imperial palace in the Citadel, which they are slowly repairing and rebuilding. It was very hot but with loads of covered walkways and beautiful gardens it was easy enough to hide from the sun. We discovered a beautiful garden full of bonsai behind a broken barrier which, after we left realised wasn’t technically open to the public yet, but us and a few others had discovered and it was nice to get away from the crowd. We ate such a lot of good food during our stay here, but this night Paul had booked a posh French restaurant as a special treat. Here I indulged with a bottle of red wine (something I’d not had since Georgetown Malaysia) and we both treated ourselves to a steak. It was bliss. 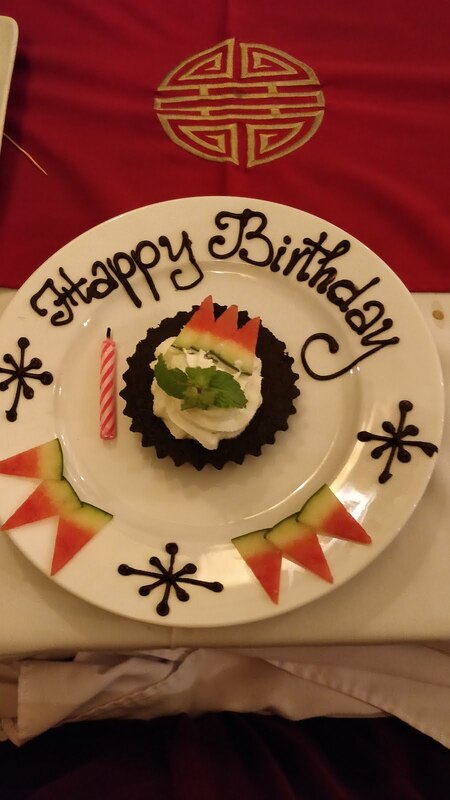 At some point in Pauls emails with the restaurant he had mentioned that this was a special romantic meal because we had been on the road a while, which they must have misunderstood as after the main meal all the lights got dimmed and I got presented with a birthday cake and candle! The whole restaurant sang me happy birthday whilst I died of embarrassment, but we thought it was easier to go along with it plus this means we got free cake! 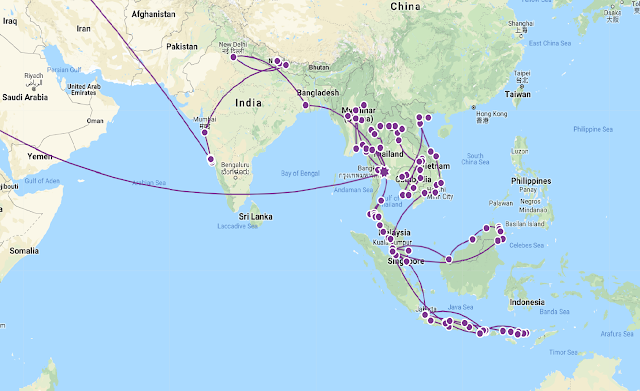 The following day we’d booked a car and driver for a half day to whizz us around a few different sights. 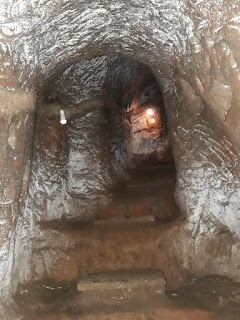 We visited the tombs of 3 different emperors, 2 of which had huge sprawling gardens and adjacent tombs for wives and 1 which was smaller but highly decorated both inside and out. We also tried to get into an abandoned waterpark which has become popular with backpackers in recent years, but the government have deemed it unsafe and have security to stop you entering. If you believe the internet some of these guards will accept bribes but our driver seemed shocked by this thought and wouldn’t let us try, instead he took us to a nearby church where we saw 4 bridal parties having their photos, all the brides looked stunning in their bright red wedding gowns. A quick stop at the Thien Mu Pagoda just on the outskirts of town and we headed back to our hotel to hide for a few hours before dinner. On David from Lam Travels recommendation we had decided to only go to Highway 1 of the DMZ areas as this cut costs, time and according to him held the more interesting bits. We were going to pick up an English-speaking guide in Dong Ha which was a 2hr drive away and then go to the Frame of a church, Vinh Moc tunnels, Hien Luong Bridge and Doc Mieu base. We actually did the church before we picked up the guide as it is located before the town, but we already knew that this was the shell of a church riddled with bullet holes, one of the few remaining buildings from the war. Our guide was called Tom and he was born in 1954 in a small town close to the bridge. He remembers having to move home quite a lot when he was younger and had fascinating stories on hearing the bombs and watching the tracer bullets shooting across the night sky. 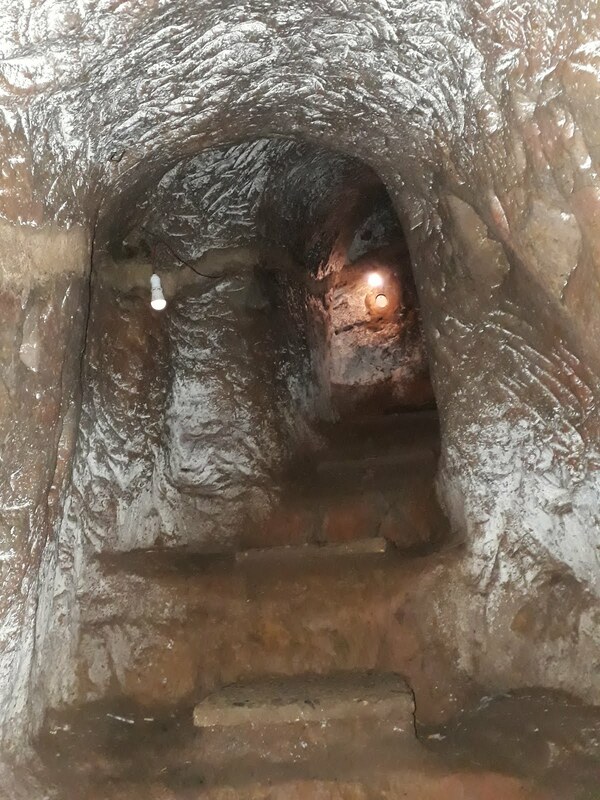 The entire tour was fascinating, with the highlight being able to go down some of the tunnels that the villagers lived in for 6 years but as a lot of these places or stops have been created specifically for tourism it can feel a bit forced. For example; I’m not sure why they have the Doc Mieu base listed on the itinerary as there isn’t really anything left of the base now, a few crumbling buildings in the gardens of newer family homes and a tank so overgrown that you can hardly see it and in our instance this was viewed from the opposite side of a busy road that we couldn’t cross. The town of Dong Ha is listed as well but this is a very busy town now with no hint of the US bases they had there during the war. We got dropped off back in town about 2pm and decided to go grab a bite to eat and a cold beer, before doing a few chores and packing for an early start the next day. This went slightly wrong as we found a place that was selling a mug of beer for 8k. We’d already put away a few drinks and ordered food when an Englishman, Canadian woman and an American guy (sounds like a stupid joke already) joined us at our table. We stayed there for a few more and then followed them down the road to a hostel they had earmarked, which to our horror was the same chain as the one we’d spent 3 drunk days at in Mui Ne. The evening got messy, street games were played, the English guy went home to bed about 8 and we didn’t get any of the things done that we needed to for our 4:30am start, but it was a fun night out. We did manage to drag ourselves away at 9pm for a quick dinner before packing and falling into bed.